Frequent chocolate-eaters actually tend to have smaller BMIs, the ratio of height and weight that's used to measure obesity, than those who eat it less often, according to a study published in March in the Archives of Internal Medicine. Needless to say, we're pretty darn excited about that evidence! Even though chocolate can be loaded with calories, the researchers say its high antioxidant content may promote weight loss. There’s also evidence that eating chocolate prevents that feeling of deprivation that plagues most dieters. Intense cravings can lead to binges, so rewarding yourself with a sweet treat might help keep you on track. We’re always on the hunt for new ways to go beyond the average chocolate bar, so here are some new treats! Coyote Oaties cookies are made from whole rolled oats, and health friendly essentials such as walnuts and cashews, without the use of added preservatives, white sugar, or flour. They’re so full of oats that they could pass for granola. 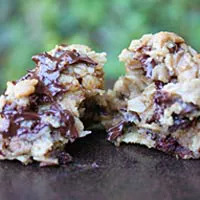 Try the milk chocolate walnut or peanut butter dark chocolate cashew. Pair with Greek yogurt and berries, and you’re set! 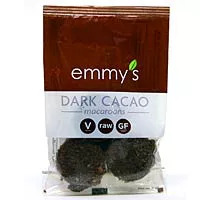 Try Emmy’s Macaroons in Dark Cacao. Each macaroon is only 50 calories with a rich, dense texture that satisfies a mid-day craving. And if you’re having a rough day and need a little extra perk (we all have them), go ahead and finish the pack! 150 calories suits a snack and definitely will not set you back. 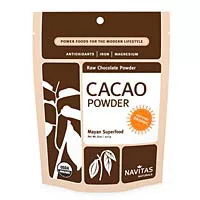 Cacao powder is rich in antioxidants and fiber. Although this unsweetened chocolate is not like the kind you’re used to, it’s natural, bitter flavor tastes great with other spices on meat or poultry. I suggest adding a bit of raw cacao powder to your spice rub for a tasty steak or lamb entrée. With a glass of red wine, this meal is a winner! Enjoy a chocolate fondue for dessert with added hazelnuts for an extra burst of heart-healthy nutrients. 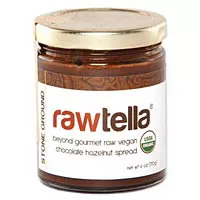 A great choice is Rawtella’s Chocolate Hazelnut Spread for a creamy, pure taste that complements every fruit in your fridge. Gluten-free, without added salt or oils, how can you feel guilty? It goes great with a fruit medley of bananas, strawberries, and mango, as well as with some marshmallows and graham crackers for a good old-fashioned s’more.